I have seen a lot of hype about this little set of brushes within the blogging world and i decided .. I want a peice of that ! I paid £21 in boots and it included 4 brushes and the case to keep them in. 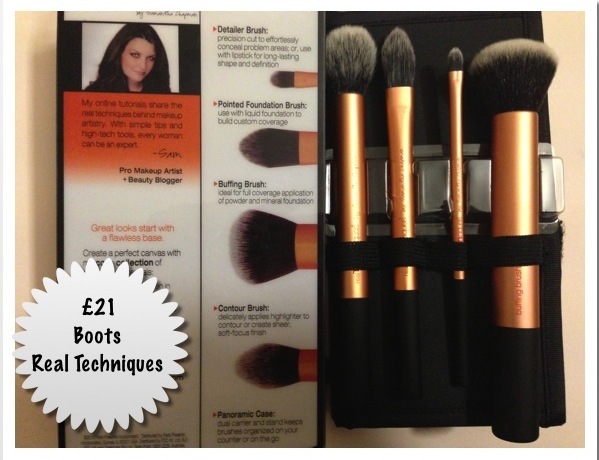 I choose this set to start with as it has the basic brushes. I didnt actually use brushes to apply my makeup apart from a bronzing/blusher brush and then eyebrow/eyeshadow so I was all new to the huge world of brushes. I searched the youtube world for correct ways to use these brushes and i couldn't really find an exact demonstration more just people raving about how good they are and what they use them for. I decided to just have a play around over the past few weeks using each one differently until I became comfortable with using them with my own makeup. I use for concealer, I used to just blend concealer in with my finger but now i see it actually saves wasting makeups and you don't get smudgy finger marks all on your face. It works well for under eyes as it is a soft brush and doesn't hurt to apply a little pressure. Im not converted to this brush yet, i still prefer to use a little sponge to apply liquid foundation. i have tried it out a few times but i still feel like i have to then go over it with my little sponge. I'm not sure if you just use this brush for certain areas but for all over my face it just doesn't work for me. iv tried to use it for concealer too but i prefer the detailer brush. Wow ohh wow, i could not live with out this now ! I used to just use those little pad sponges to apply my powder foundation but now i could never go back to that. it gives my face such a cleaner and more natural finish so much better than looking powdery like before ! i would truly recommend this brush to any one. i am unsure what others use it for but for me it works so well. Im still getting to grips with this one .. Im not a contour person, mainly as i am unsure of how to do it but i do wish to learn when i have the time! i use this brush to apply my blusher/bronzer and again i love the finish and how natural it looks on my face. it works so much better than the big brush i had before. Has any one else tried these ?